Seth Masia teaches skiing out of the Vail Village locker room of the Vail Ski and Ride School. 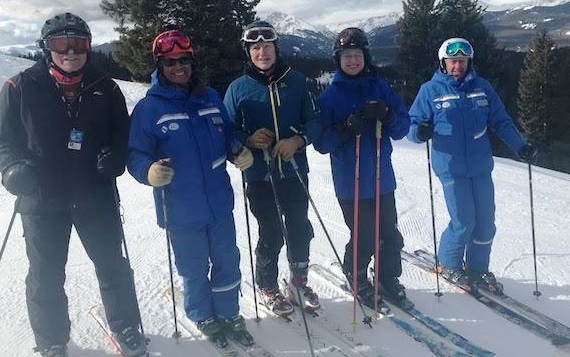 He first skied on the glaciers above Chamonix in 1968, and was technical editor of SKI Magazine for two decades beginning in 1974, and has since skied around the world. He began teaching at Squaw Valley in 1984. Seth retired in 2014 as executive director of the American Solar Energy Society. 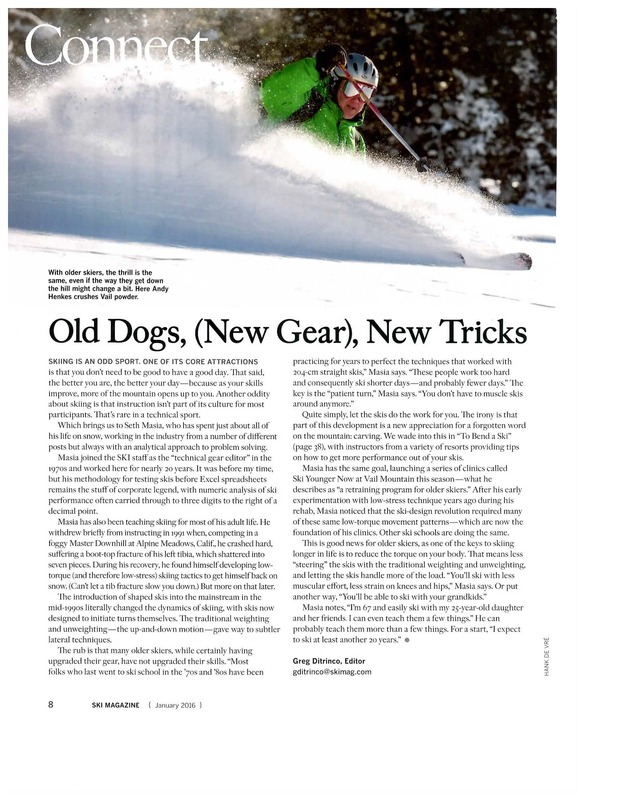 The January 2016 issue of SKI Magazine contains this article by editor Greg DiTrinco. Thanks, Greg! Here’s a history lesson: When Norwegian farmers began running across snowy meadows on planks of wood, they quickly discovered that where the snow drifted deep, the plank flexed. When you jumped on the middle of the plank, it bowed downward into the snow. This meant that in order to push the ski forward, you had to push it up out of the hole it had made in the snow. That took a lot of work. Some bright soul figured out that if you steamed the plank and bent it into a gentle arch (what we call camber), the skier’s weight would spread more evenly across the surface of the snow, and the skier’s weight would straighten out the camber instead of sinking into the snow. The loaded ski now made a more-or-less straight beam and could be pushed straight ahead. Running got a lot easier. If the camber were made high enough, you could carve the tip and tail a lot thinner, making the ends lighter and more supple. The ski became even easier to run on, and floated nicely over uneven snow. By about 1840, in the Telemark region, local woodcarvers had figured out sidecut. Making the ski narrower in the middle helped the ski turn with better agility. But the narrower waist tended to sink deeper into the snow, so to avoid the original problem of the center sinking, the middle of the ski had to be made a bit thicker and the camber a bit higher. Thus, by trial and error, ski-makers learned the art of balancing flex pattern against sidecut and camber. Change any one element and you had to change the other two. One more element entered into the balance: torsional stiffness. In a ski meant for running across uneven natural snow, you wanted a supple tip to float over and conform to the surface. But you needed strength, too — if the tip were too thin and soft it would break. As long as a ski was made from a single piece of wood, a clever solution was the ridge-top shape, carved with a central reinforcing rib standing above the top surface. The rib reinforced the ski’s beam flex (its stiffness in bending) but allowed it to twist a bit to absorb the impact of sastrugi, suncups, and the like. After 1935, quality skis were laminated from a variety of tough hardwoods and lighter softwoods. As I mentioned yesterday, all alpine skis were still more or less the same shape, so the adjustable elements were flex and weight. Now, by choosing and aligning the laminates, a skimaker could adjust the torsional stiffness more-or-less independently of the beam flex. The ability to do this took a quantum leap with the adoption of aluminum and fiberglass structures. It became clear that racers wanted higher torsional stiffness than recreational skiers. For grip on ice, race skis were engineered with torsional stiffness around 1.9 newton-meters per degree. This proved to be a practical limit: if the torque went much higher (some metal skis went to 2.5 nm/deg) they felt harsh and hooky, and had to be edge-bevelled pretty aggressively. Most recreational slaloms — bump skis, for instance — torqued at about 1.7 nm/deg. At 1.5 nm/deg and below you had forgiving intermediate skis. And a balance had to be found between torsion and beam flex: at K2, where I worked at the time, we called this the “torflex ratio.” A stiff beam flex, for a stronger, more precise skier, could use a stiffer torsion. When “shaped” or deep-sidecut skis first appeared, it took a couple of years for engineers to figure out new flex patterns and torque ratios. Early shaped skis had a tendency to “hinge” in front of the binding, so they sort of plowed in deep snow — it was the original sinking-plank problem all over again. Compared to straight skis, it was found that shaped skis needed a longer stiff section in the middle and softer ends, and the progression of flex distribution had to be matched to the exaggeration of the sidecut. Similarly, torsion had to be softened a bit at the ends to soften the edge bite. Otherwise, the new wide shovels had a tendency to climb up the sides of moguls, and the new wide tails were reluctant to release at the end of the turn. Balancing flex and torsion to sidecut is an art. It requires skill in adjusting core thickness, and clever choice of core laminates. Getting it wrong isn’t a disaster — a ski that feels a little harsh at the ends can usually be fixed with some smart tuning. But it’s so much more satisfying to get it right. For more detail on sidecut see Evolution of Ski Shape.